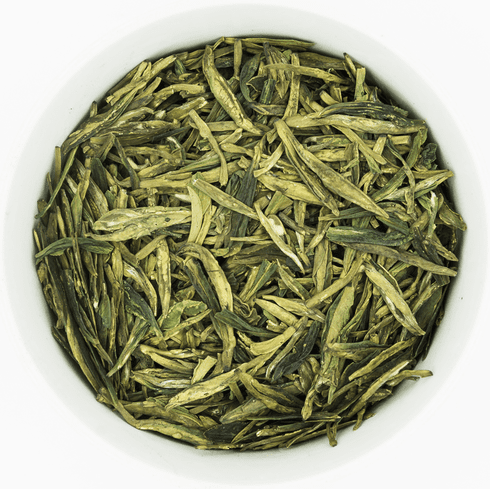 This very fine Dragon Well Green Tea is harvested early in this year's Spring crop. This tea was shipped by air freight to provide our customers the freshest quality as seen by the beautiful green color of the leaves. The steeped tea has a light yellow hue and a light orchid-like aroma with fresh undertones. The taste is fresh and the aftertaste is thin and smooth. This tea is available in very limited quantities and until supplies last. The water used to steep this tea should be about 175-195�F or 80-90�C. Use about 2 teaspoons (3 g) of tea leaves for about every 5 ounces (150 mL) of water. A steeping time of about 2-3 minutes with more or less time is recommended depending on the desired concentration. As a rough guide, the higher the temperature of the water or the greater the amount of leaves used, the shorter the steeping time should be. Green tea can be kept fresher longer by sealing the tea and storing it in the refrigerator away from items with strong scents or odors.